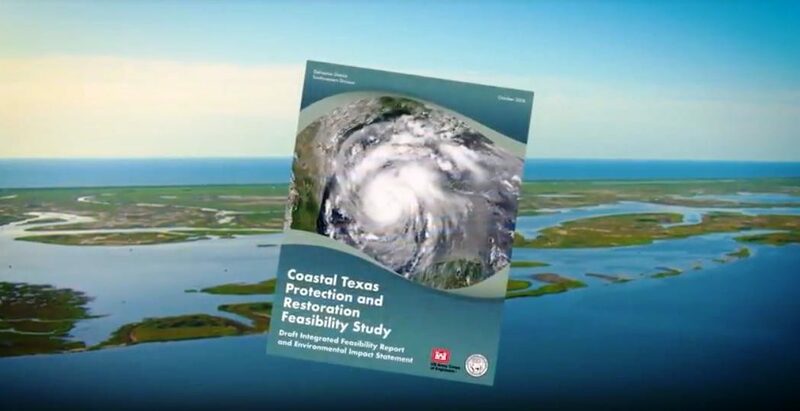 In October of 2018, the Texas General Land Office (TGLO) published a video about the new Coastal Texas Protection and Restoration Feasibility Study (AKA “Coastal Texas Study”). The video highlights the report’s engineering, economic and environmental analyses on large-scale projects, in the hope of receiving restoration funding from Congress. The U.S. Army Corps of Engineers, in partnership with the Texas General Land Office, began an examination in November of 2015 of the feasibility of constructing projects for coastal storm risk management and ecosystem restoration along the Texas coast. According to TGLO, the Coastal Texas Study recommendations will enhance resiliency in coastal communities and improve their capabilities to prepare for, resist, recover and adapt to coastal hazards. The feasibility study and report will be complete in 2021.